Shops : YES, Jewels of the Nile, Marshall-Rousso, Market Place, NASCAR Racewear, Sahara Spirits. 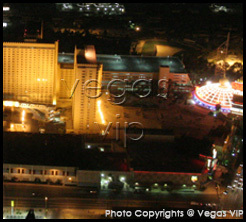 Address: 2535 S. Las Vegas Blvd. Restaurants : House of Lords, Paco's Bar & Grill, Caravan Caf・ Sahara Buffet, NASCAR Cafe and The Grind Cafe. 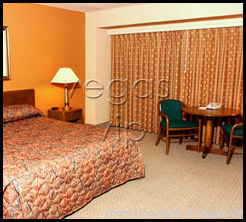 Hotel amenities : Currency exchange, safety deposit box, laundry, luggage service, maid service, video arcade, wake-up call. The Sahara opened its doors in the early 1950's and has hosted a plethora of major stars ever since ・both as performing artists and guests. Amazing architecture awaits all who enter with gigantic towers and a breathtaking Moroccan theme. The Sahara has some of the city's hottest thrill rides, excellent entertainment and more than 1,700 of Las Vegas' most comfortable rooms and suites. For an empty stomach, the Sahara offers a popular stop known as the House of Lords, featuring delectable steaks and much more. Paco's Bar & Grill and the NASCAR Caf・offer a more casual atmosphere for dining. 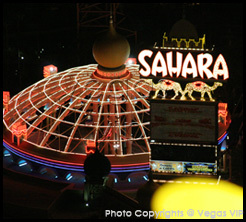 With an 85,000 square foot casino, the Sahara host some of the Strip's hottest and most up-to-date slots, including ticket in and out. Guests can play huge jackpot progressives, lively video poker or an array of slots. The Platters, Cornell Gunter's Coasters, Beary Hobb's Drifters, the Amazing Johnathan and the Scintas perform in the Congo Room. For a see-it-to-believe-it time, visit the Sahara.